1. Strain the cherries, reserving 100g of the syrup from the jar. 2. Place the cherries and the reserved syrup with the fruit sugar and cinnamon in a small saucepan over a medium heat, and simmer until the amount of liquid has reduced by half. 3. Using a hand-held blender, blitz the cherry mixture for 30 seconds. Pass through a fine sieve into a bowl, pressing with the back of a spoon to ensure everything passes through. 4. Stir in the almond essence and balsamic vinegar, then set aside to cool completely. 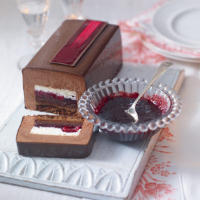 To serve, drizzle compote over slices of Black Forest Buche, and sprinkle with vanilla salt. This recipe was first published in November 2011.